“First Reformed” (2018). Cast: Ethan Hawke, Amanda Seyfried, Cedric Kyles, Victoria Hill, Philip Ettinger, Michael Gaston, Bill Hoag, Frank Rodriguez. Director: Paul Schrader. Screenplay: Paul Schrader. Web site. Trailer. Pastor Ernst Toller (Ethan Hawke) is, somewhat ironically, a troubled soul. As a former military academy chaplain who has suffered a number of personal tragedies and a crisis of conscience, he’s been assigned to what would seem to be a soothing, less stressful post – overseeing the operations of the First Reformed Church, a historic parish in Upstate New York. Established in 1767, his church has a long and celebrated history, but it has fallen on hard times in recent years. The parish has become more of a tourist destination than an active fellowship, and its paltry congregation is too small to support the ongoing monetary needs of the church. To stay afloat, First Reformed’s finances are propped up by sales of souvenirs and the generous bankrolling of the nearby Abundant Life megachurch, a facility run by one of Toller’s few friends and confidantes, the charismatic Pastor Joel Jeffers (Cedric Kyles, a.k.a. Cedric the Entertainer). Toller sees the necessity of these measures, but he dislikes the commercialism of a church hawking tee shirts, and he’s uncomfortable continually accepting charity. Pastor Toller’s woes don’t end with his past and the troubles of his parish, either. His health has been giving him problems, and he’s slowly losing a battle with the bottle. He’s also uneasy with the fallout from his brief romance with Esther (Victoria Hill), a kind but incredibly clingy parishioner. Their affair apparently ended awkwardly, and she’s unwilling to let go of it. All told, it’s quite a full plate. 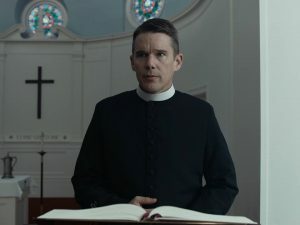 Pastor Ernst Toller (Ethan Hawke) wrestles with a bundle of personal issues in the intense new drama, “First Reformed.” Photo courtesy of A24. As a scholarly, thoughtful sort, Toller spends many hours in study, particularly the works of authors like monk Thomas Merton, looking for the answers that perpetually seem to elude him. He also keeps a journal to sort out his thoughts, passages of which are read as voiceover narrations. However, these attempts at grounding himself offer little solace or insight, arguably making things even worse. As time passes, he seems to sink further and further into the depths of despair, both for himself and in his perspectives on the state of the world. Those feelings become exacerbated when Toller is approached by one of the members of his congregation, Mary (Amanda Seyfriend), who asks him if he’d be willing to help counsel her husband, Michael (Philip Ettinger). As a somewhat overzealous environmental activist who was recently released from a Canadian prison for compassionate reasons (Mary is pregnant), Michael is severely depressed about the future of the planet and has serious reservations about bringing a child into a world whose ecological prospects look increasingly bleak. He believes that ending the pregnancy could be the best course. Being the compassionate soul that he is, and despite the weight of his own personal challenges, Pastor Toller agrees to speak with Michael.  He offers what uplifting guidance he can, drawing from both scripture and personal experience, but he finds that the arguments Michael raises to defend his perspective are difficult to counter. In fact, the Reverend even begins to sympathize with his troubled parishioner’s position. He comes to see the perils associated with environmental degradation, and it reminds him of Biblical passages that call upon humanity to be dutiful stewards of the earth, caretakers of God’s creation, a task at which he, like Michael, increasingly believes we’re failing – and miserably. While the Pastor’s emerging environmental sensibility only adds to his despondent state, he nevertheless appears to be going through a personal evolution, one in which he seems more willing to address practical secular matters rather than staying trapped in the realm of purely lofty philosophical issues. He takes steps in which he rejoins the world. And, even though his focus is almost exclusively on the negative, his evolving attitude nevertheless represents a fundamental change in outlook, one that increasingly prompts him to take a stand by taking decisive action, especially where the environment is concerned. That urge is further energized when he learns that one of the largest donors to Abundant Life (and, by extension, to First Reformed) is also one of the worst polluters on the planet. 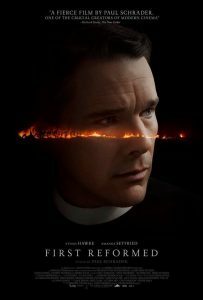 Mary (Amanda Seyfried), a young mother-to-be, seeks counseling for her troubled husband from an equally troubled pastor in writer-director Paul Schrader’s gripping new drama, “First Reformed.” Photo courtesy of A24. Others can see the pain he’s going through. Esther offers him comfort that he routinely rejects. Pastor Jeffers tries counseling him as well, observing that Pastor Toller spends “too much time in the garden,” suggesting that he’s trying to take on even more of the weight of the world than Jesus did. Even the joy that the upcoming 250th anniversary celebration of First Reformed’s consecration should engender does little to raise his spirits. Those who genuinely care about his well-being try to convince him that there’s nothing wrong with being happy in life and that actively seeking it out is part of our fundamental human nature, but these suggestions tend to fall on deaf ears. The only one who seems able to successfully reach out to the troubled pastor is Mary. But is her encouragement enough? And will he get the message? So why is the good Reverend so full of angst, misery and quiet desperation? Sadly it’s because he’s choosing to be. Given his personal experience and the conditions around him, he’s focusing on them to the exclusion of other possibilities, which are just as available, even though he’s opting not to see them. By taking such a narrow view of things, he comes to believe that this is how reality is and operates, and the more stock he places in those beliefs, the more they become reinforced, and ultimately entrenched, in defining the character of his existence. Elements that typify this outlook become manifest and frame the nature of his world. And it unfolds in this way, because that’s how the conscious creation process functions, the means by which our reality comes into being through the power of our thoughts, beliefs and intents. Of course, Pastor Toller needn’t choose this path if he doesn’t want to. Because we’re each capable of choosing from an infinite range of belief possibilities at any given moment, he could just as readily pursue a different course by embracing different belief options. On some level, he even seems to sense those possibilities, as evidenced by the questioning he raises through his journaling and studies. But, if switching paths is so easy, why doesn’t he do it? That’s a good question. As with any of us, only we truly know why we adopt the belief stances we do (and sometimes the reasons elude even us). In many instances, we choose to follow certain paths in order to learn various life lessons, for better or worse, and the only way to experience them is to intentionally manifest them for ourselves, regardless of their nature. But that naturally begs the question, why would we want to learn lessons like those Toller is experiencing? Pastor Joel Jeffers (Cedric Kyles, a.k.a. 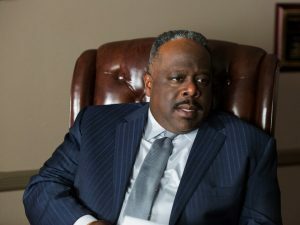 Cedric the Entertainer), the charismatic head of a megachurch, tries to offer help to a troubled peer in “First Reformed.” Photo courtesy of A24. Again, the reasons (and the beliefs behind them) are each our own. But perhaps we need to go through certain experiences purposely to see and appreciate the other side of the coin. In Pastor Toller’s case, for instance, perhaps he needs to immerse himself in despair as a means to learn how awful it can be as a prelude to experiencing its opposite, joy. For him, maybe this is possible only after having mired himself in sadness for so long that he can no longer tolerate it and wants something else – and something better. However, perhaps the only way he can come to realize that is to create the despair first, giving himself something as a basis of comparison to the elation that’s available to him whenever he finally chooses to embrace it. Admittedly that’s a rather hard way to find out, but, for some of us, learning the hard way may be the only way we can get the lesson. In some ways, Toller’s choice of vocation lends itself to such an experience. While serving in this capacity can have its moments of joy, being a pastor often involves offering comfort to those in pain, a practice that exposes the caregiver directly to the suffering of others. Constant exposure to such conditions can continually reinforce an outlook like the one he holds. Is it any wonder that it would begin to wear on him, convincing him that this is simply how existence is? It would seem that it’s got to get to someone at some point, especially for someone as high-minded and idealistic as he is. One could argue that there’s genuine nobility in taking on the role of freely offering compassion to the downtrodden, and such a contention would indeed have merit. Toller certainly seems to abide by such principles, truly caring for those to whom he ministers, no matter how small his congregation. But, given his high standards and ready willingness to give of himself to others, this practice can become wearing, no matter how good his intentions. 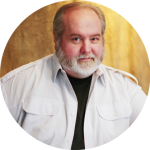 Expecting perfection and splendor in a reality brought into being by the kinds of beliefs Toller holds can lead to exasperation, perhaps even the pursuit of desperate measures, including those that many would find objectionable and out of character. In this regard, many viewers and critics have astutely observed that there are many parallels between the narrative of this film and one of writer-director Paul Schrader’s previous pictures, “Taxi Driver” (1976), for which he wrote the screenplay from which filmmaker Martin Scorsese directed. Even though there are a number of fundamental differences between Toller and Travis Bickle (Robert DeNiro), the protagonist in “Taxi Driver,” there are also a number of uncanny similarities in their outlooks, actions and circumstances. Indeed, it’s difficult to manifest a perfect world in one in which the beliefs creating it are full of imperfections, a situation that can lead to frustration and, eventually, desperation. One can only hope that Toller finds the peace for himself that he so compassionately attempts to offer others. But, as has been often said, “Charity begins at home,” and the good pastor should consider taking care of himself with the same principles of empathy and concern that he shows his parishioners. By operating from a position of personal strength and a joyful perspective, he may find a very different reality emerging around him, something that will benefit him and those to whom he attends. There’s quite obviously much to consider in this offering. “First Reformed” presents a captivating examination of the difference between being in the world or apart from it, regardless of whether we’re devoted spiritual practitioners or principally secular beings. It explores the meaning of despair, the search for happiness, and the need to strike a balance between our sacred and worldly lives. It probes our prevailing core outlooks, whether we choose to see the glass as half full or half empty (or, in even more extreme terms, completely full or completely empty). And, of course, it asks us to examine our faith, not only in our divine connection, but also that of it in ourselves and in our fellow man. 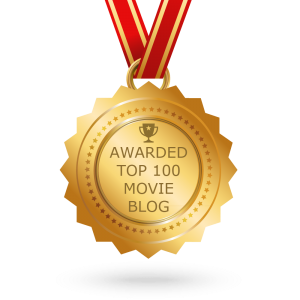 While some elements of the picture are a little dragged out (likely intentionally to convey to viewers the burden the protagonist is saddled with), much of the film sizzles with an underlying intensity that you can feel in your gut as the story unfolds. As Toller’s story plays out, we can empathize with the dark night of the soul issues he wrestles with, so much so that it almost feels as if we’re being dragged along for the ride (and a rather uncomfortable one at that). With what is undoubtedly Ethan Hawke’s best screen performance, a surprisingly strong portrayal by Cedric Kyles in a dramatic role and phenomenal atmospheric cinematography, writer-director Paul Schrader has put together a film that gives us all much to contemplate, as well as emotional impressions, both haunting and uplifting, that will stay with us long after we leave the theater. This is handily one of the best releases of 2018 thus far. When faced with the kinds of choices posed in this film, we’re reminded of the importance of our power of free will. It’s one of our most precious birthrights. Yet it’s of little value to us if we fail to make use of it. Retaining sight of it is crucial, especially at those times when we face moments of personal crisis. We can choose to languish in the depths of despair or to aspire to something more elevated. Let’s hope we have the insight to see the difference and make the right choice.